As an immunologist-to-be, few things frustrate me more than hearing of misinformed antivaccine sentiments. I have been of the opinion for some time now that education about vaccines should begin in high school to give students the tools to properly combat misinformation campaigns. Thus, when I learned that Johns Hopkins was looking for applicants to design and teach a summer lecture to high school students on a “Miracle of Modern Medicine,” I jumped at the opportunity to propose a class on vaccines! I was thrilled when my proposal was accepted amongst those from nine other Johns Hopkins graduate students, postdocs and clinical fellows, who proposed to teach classes about other fascinating topics, including genomic editing, autopsy and organ transplantation. The class consisted of 23 very bright high school students, ages 14-17, from all over the country and the world, who came to Hopkins for this summer course. My goal for the class was to have the students learn and think about vaccines not only through the eyes of a scientist, but also through the eyes of an epidemiologist. I designed my lecture to be interactive and to invoke critical thinking. We discussed the history of vaccines, including their discovery, their development and their huge impact on public health. We then discussed the future of vaccines in the context of cancer research. I was very impressed at the students’ ability to quickly absorb the new material and use logic to brainstorm ideas to answer complicated questions I posed to them. After the lunch break, I organized a case study on HPV vaccines. To provide some background on the premise, there is currently a very effective, commercially distributed HPV vaccine, Gardasil, that protects against the most dangerous strains of HPV that can cause cancer. However, due to lack of education about the vaccine, stigma and an optional vaccine policy, among other reasons, vaccine coverage is not at target levels. On the other end of the spectrum, there is an increasing effort focused on developing therapeutic cancer vaccines, or immunotherapies, to cure cancers caused by HPV. I divided the students into groups of four and told them to pretend they were wealthy philanthropists who had decided to donate $10 million to HPV-associated cancer research, but that they were to decide if they wanted to focus their funds on improving the already existing — and successful — preventive vaccine, or to fund development of a curative cancer vaccine. They could choose to divide their money any way they would like, but they had to specify exactly what they wanted their money to go toward and why. For example, if they want to donate to prevention, do they want their money to go toward making the vaccine cheaper? To educational campaigns? To making the vaccine cover more strains? I pushed them to endeavor to donate to the causes through which they believed their money would save the most lives. I gave the students readings on an overview of HPV and cancer, an overview of the Gardasil vaccine, a simplified review of opportunities and challenges to developing immunotherapies for HPV-associated cancers, and a review on barriers to increased Gardasil vaccine coverage in Appalachia. After reviewing the materials, the students were to give a five-minute presentation on how they decided to allocate their money. 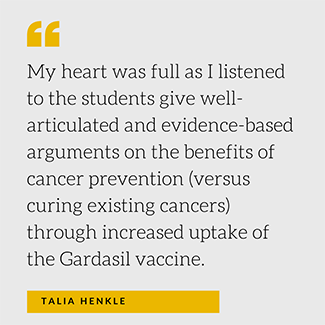 My heart was full as I listened to the students give well-articulated and evidence-based arguments on the benefits of cancer prevention (versus curing existing cancers) through increased uptake of the Gardasil vaccine. Each group independently identified the importance of funding more educational campaigns to achieve that goal. I was elated that the students, given only simple reading materials, had arrived at the same conclusion that had motivated me to teach the class in the first place! The students also all appreciated the importance of funding the existing need for cancer-curing immunotherapies. After a vote at the end, the class decided to allocate more money to improving uptake of the Gardasil vaccine ($6.5 million) than the cancer-curing vaccine efforts ($3.5 million). All in all, teaching this class was a fantastic experience that I would repeat in a heartbeat. I feel hopeful that the world now has 23 new ambassadors for vaccination and the importance of education in accomplishing that goal! One Comment on "Teaching About Vaccines — A Miracle of Modern Medicine"
Great work Talia! Education is key, and starting with a younger population eager to learn is fantastic!